Well, you have read about her travels on our site and now you have a chance to own the vessel that has taken her owner's on their adventures. The owner's growing group of visiting friend and relatives has forced them to the conclusion that they will need a larger vessel in the not to distant future. I am not going to say much more about her, as her logs posted on this site tell more about her then I ever could. I would like to thank the owners for their support on the site and choosing and me to assist them with the her sale. This level consists of five watertight bulkhead compartments. The stern features a generous lazarette with steering system, two large stainless steel tanks for fresh water, and four chest freezers. 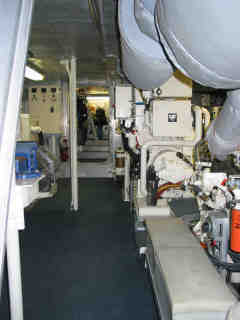 Forward of the lazarette is the spacious engine room with full standup headroom. 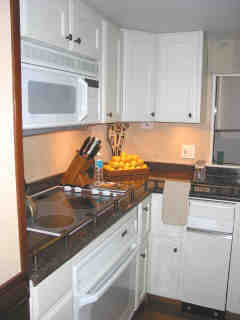 Next forward is the Owner's tool and workroom. All the way forward is a large pump room and storage area. The final forward bulkhead of this pump room separates the crash bulkhead and the chain lockers of the anchors. There is no living quarters below the water line, which eliminates sump pumps for showers and the numerous hatches and access panels that are common on most yachts. From the 5' swim platform, which contains two 100-gallon gas tanks for the tender and toys, dual stairs lead up to the Aft Deck. 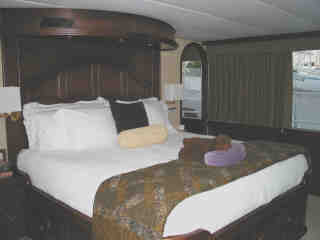 There is a spacious settee for 6 under the overhang and a gas barbecue grill. There are two stern capstans located port and starboard. Moving forward one enters the Main Salon, which features great windows, large sectional sofa, two stuffed chairs, dining room table, full service bar, and entertainment center. Forward is the fully equipped Galley with modern appliances, huge storage, including a 36 cubic foot side-by-side refrigerator. Opposite the galley is a breakfast settee for 6 and a laundry room with full size washer, dryer, laundry tub, wet storage locker, and folding area. 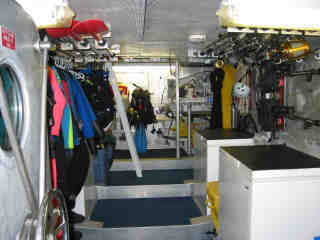 A watertight door adjacent to the galley goes down to the machinery room. 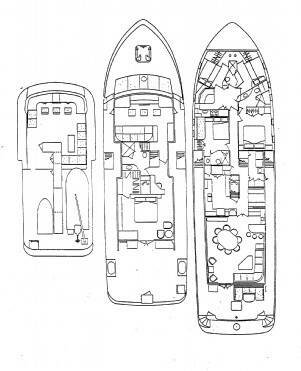 Forward of the main deck are crew quarters/kids' quarters with port and starboard double bunk berthed cabins in the forward bow including crew's head with shower on centerline. 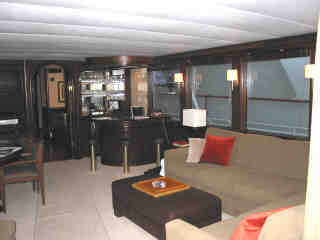 Next is the crews' lounge with complete dinette and galley including 4 burner stove, side by side refrigerator and additional equipment From a passageway aft is access to the VIP staterooms . 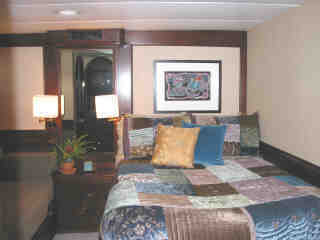 The starboard stateroom features a queen size bed and the port stateroom a double bed and settee, each with ensuite baths. The wheelhouse compares to one's cruise ship in size, equipment, and comfort with 3 pilot seats and a raised settee for 8, with a remarkable 270-degree view. Behind the wheelhouse is the Owner's den, Master stateroom with king size bed, dressing room and doors opening to an incredible private deck. Just aft of the wheelhouse to port, an internal stairway leads to the Flybridge , which features a hard top, 3 pilot seats, steering and engine controls. 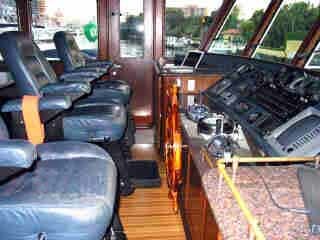 There are also steering and engine controls located port and starboard on the side decks and on the aft deck. 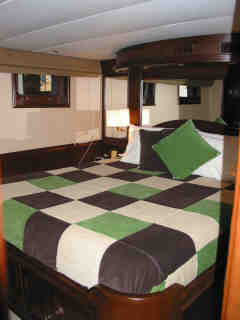 Aft is the sundeck with a 2-ton dinghy davit, 18'6" Novuraina, 2 jet skis and a kayak. There are also storage lockers. 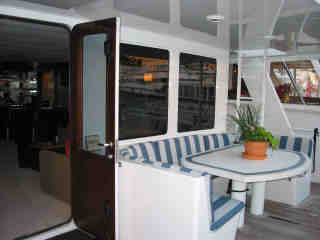 Stereo system with Bose speakers distributed throughout the vessel. (4) TV receivers with 3 VCR and DVD, gyro stabilized Direct TV satellite receiving antenna and PBX telephone system with Mitsubishi satellite and cellular systems. 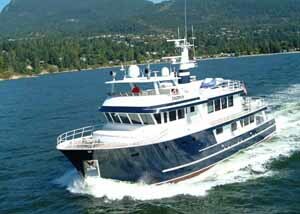 Exodus' proud bow and aggressive forward slanted windows transmit her tug/workboat heritage for all to see. 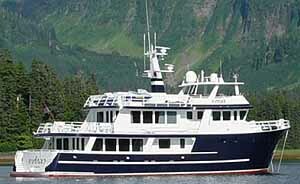 This vessel is a proven explorer yacht. 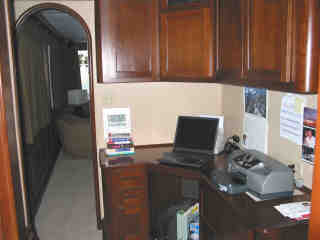 The entire lower deck is dedicated to her operational systems and stowage for extended voyages. Her guest and crew accommodations are located on the main deck where one can take advantage of the stunning vistas that pass by her large windows during extended voyaging. The grand master cabin is located behind the wheelhouse befitting a vessel that was designed and built for knowledgeable hands on owner. Exodus' 23'6" beam combined with her long overhangs creates massive interior and deck space. She is fully equipped, in excellent operation order and ready to take her next owner's on new adventures to often visited or remote locations in safety and comfort. A detailed inventory list of exclusions of Owner's personal effects and artwork will be provided pursuant to a purchase agreement.